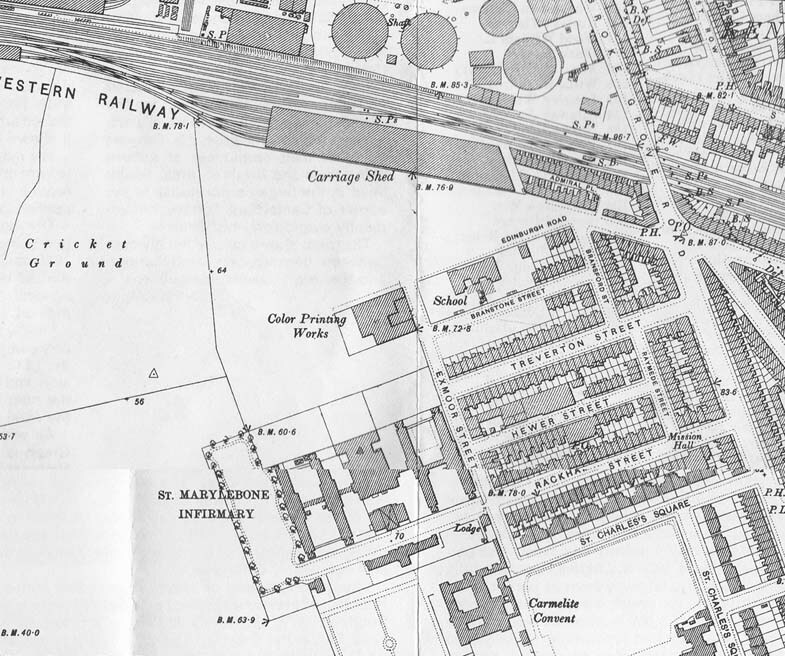 Above is a view of the St Marylebone Infirmary, now St Charles Hospital as seen from a cricket ground that is clearly marked on the Ordnance Survey map of 1894/5. This photocopy came to us years ago from the grandson of a groundsman at St Quintin Park. We think it was taken from approximately where Ladbroke Hall (Clement Talbot / Rootes Building) is now on Barlby Road, looking south east to the north side of the hospital. The wall that extends the length of the hospital ground is still there. To the left of the hospital is a building that is now on the corner of Exmoor St and Barlby Road, marked on early maps as a printing works. Beyond that is Edinburgh Road School (later Barlby Road School), built in 1880. This building was demolished in the early 1970s as part of the redevelopment of the streets to the south of the school and the new school was built further towards the junction with Ladbroke Grove. The date of the St Quintin Park photo is probably just before 1900 since by 1903 work had begun on the Clement Talbot Motor Works. Barlby Road was laid out at the same time. 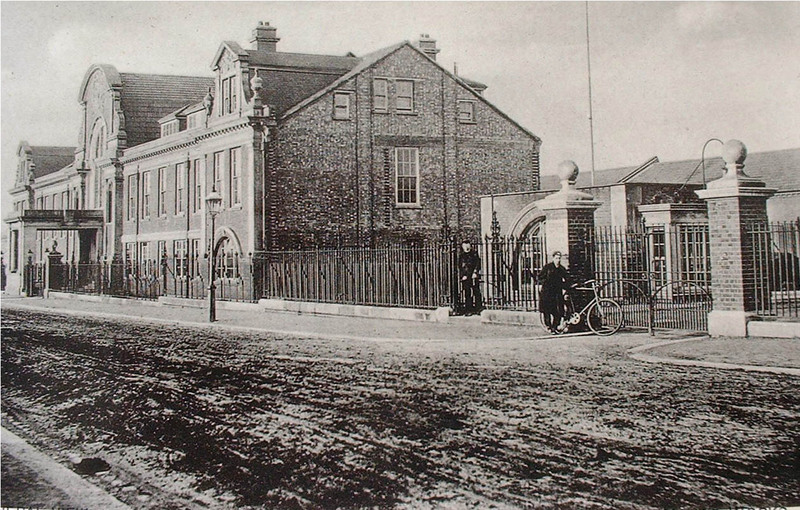 Clement Talbot Factory on Barlby Road. 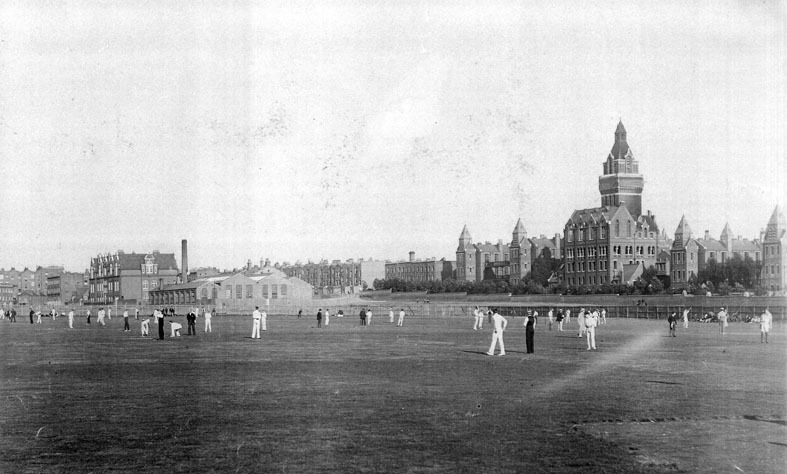 The image of the Cricket Ground is a not very good, old fashioned photo copy of the original and I would like to have a better scanned copy, but I can no longer trace the origins, so if there is anyone out there who has an original, please let us know. The photograph was labelled as coming from Jas.E. Hunt of 141 Clarendon Road, North Kensington. This entry was posted in Schools, St Quintin Park, Streets, Uncategorized and tagged Barlby Road, Barlby Road School, Clement Talbot, Edinburgh Road, Exmoor Street, Ladbroke Hall, Rootes, St Charles Hospital, St Marylebone Infirmary, St Quintin Park. Bookmark the permalink. The Watsons lived at number 15 Exmoor Street this is where my grandparents lived and my mother Jean.